This site is dedicated to the first Nissan Silvia, a handmade pretty 2 seater coupe. 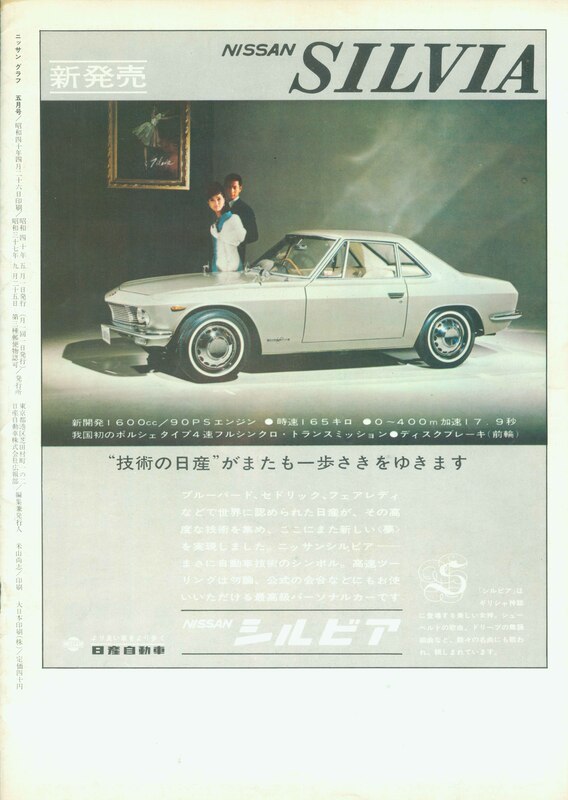 The Nissan Silvia could be deemed Japan’s/Nissan’s first attempt at a supercar (before the superlative Toyota 2000GT, exhibited later that year). Yes, by today’s standards it is slow, but back in 1965, it was expensive, beautiful, one of the fastest cars on the road at the time and exclusive. The production run lasted only about 4 years and only 554 were produced. It was never deemed to be mass production model and therefore can’t be seen as a failure, which it is tried to be betrayed by some. The design and implementation of the Silvia, was a way of showing what Nissan could do, not just to its rival manufacturers, but also to the outside world. Before the Nissan Silvia, Nissan (just like other manufacturers) produced mainly practical, cheap, economical cars for the expanding Japanese economy, like the Nissan Bluebird series (model codes 410, 411). But within these firms, some designers wanted to spread their wings, looking at European designs (not just cars but classical architecture and other influences) combined with ideas of their own to produce exciting sports cars. This didn’t mean, as some like to imply, that the Japanese just copied European designs. More the fact, around the time of the early to late 1960’s, there was a certain “style” of sports car, with designers and manufacturers visiting Motor shows all over the world. E.g., the MGB and Datsun Fairlady 1500 roadster (model code SP310) are very similar, both designed separately. It is implied the 1500 roadster was a MGB copy, but in-fact the roadster was shown and launched before the MGB. Also, viewed from the present, a Nissan design concept in the late 1960’s (one of many) looked very much like a Maserati model, even though done without its influence or knowledge. I see the Silvia conception to production as valuable learning steps in design, modelling, and production (of a handmade car) for Nissan, which, may have helped with their implementation of further concept designs and production cars, especially sports cars, probably including the S30 series.